This was the vehicle which finally got me involved with electric vehicles. It was a home-made conversion purchased by Dr Tony Fogarty, a locum at my local GP practice. The vehicle had been driven but had now failed and Tony didn't know how to fix it. I volunteered to have look and was not impressed by the conversion. Under the bonnet was a rats nest of blue and yellow wire, with no rhyme or reason for the colours or polarity of the connections. This was never going to be a properly usable vehicle, but it would be useful to make it work and gather some performance data. New batteries had been purchased (five 12V, 110Ah leisure batteries) but at only 6.6kWh, it was grossly under provisioned and they were going to be seriously abused. The aim was to keep the mechanics more-or-less as they were and just rewire it and only re-engineering components where absolutely necessary. The picture below shows the vehicle part way through that process. In the end I had a couple of relays left over and a much more logical wiring layout - with enough different coloured wires so they didn't get muddled! This was a very simple conversion, the original engine was removed and replaced with a traction motor. The motor simply bolted to a plate which joined onto the original gearbox bell housing. A coupling was made to connect the motor shaft to the gearbox input shaft; on inspection this coupling was so poor it had to be remade as part of the fix. The original gearbox and final drive were all standard which meant the motor did not need to reverse as the gearbox provided this function. Only three gears were ever used: Reverse, second and forth. 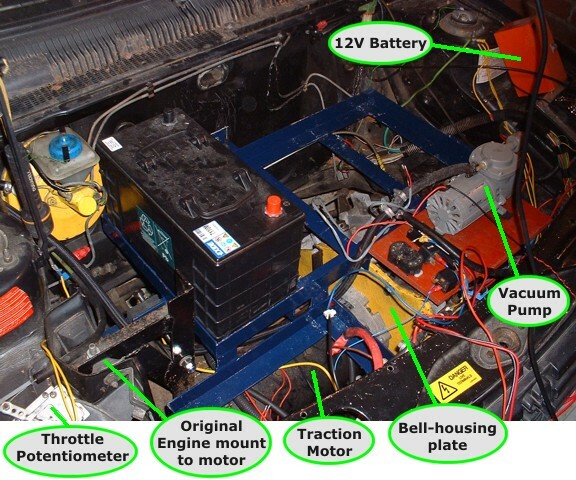 The vacuum pump is required to provide the brake servo assistance, the car is about the same weight as original so it definitely needs brake assistance. 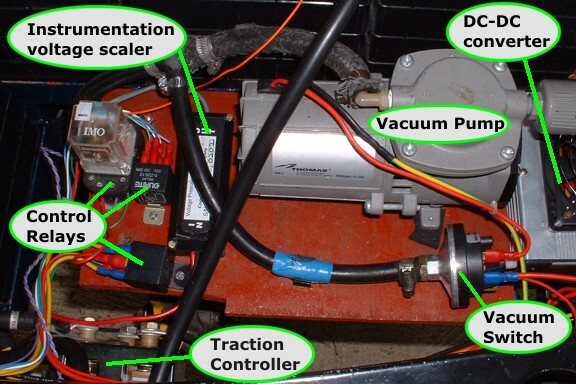 The pump only runs when needed, controlled by a vacuum switch. Just out of view is the traction motor controller which sits where the radiator used to be, a convenient location as it gets warm and has a large finned heat-sink. The DC-DC converter converts 60V from the traction battery to 12V for the vehicle standard electrical system (and a small battery), it does the same job as the alternator. 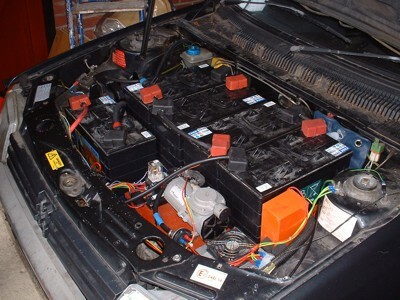 It is vital to keep track of the state of charge of the traction battery, especially when it is so small, part of this instrument is the voltage scaler, a shunt measures battery current and both measurements are taken to a 'Link-10' battery status display on the dashboard. Acceleration was entirely adequate and round town the car was indistinguishable from other traffic. However, the undersized battery meant that every trick was needed to conserve energy and coasting to traffic lights with minimal use of brakes was the order of the day. On an ideal semi-rural economy range test the Pug managed 27 miles before the battery required recharge. While the vehicle could achieve 60mph the demand on the battery meant that 50mph was the realistic maximum. Round town with regular start/stop the range was only 12-15 miles! Doubling the battery capacity would have improved the range by significantly more than twice. When a lead-acid battery is heavily discharged not only is power wasted as internal heat, but the electrochemical reaction can't keep up and capacity is 'lost', this is known as the peukert effect . The under-sized battery was being given such a tough time that a significant amount of its theoretical capacity was missing. An additional battery would not only make more energy available by itself, it would also increase the recoverable energy from the original battery, more than compensating for the extra weight. It is clear that we need a better battery and a lighter vehicle. The inefficiency of the traction motor and controller also meant we were probably losing more than 30% of our valuable energy as heat! There were losses in the original transmission too, spinning all those unused gears and stirring the gearbox and differential oil.